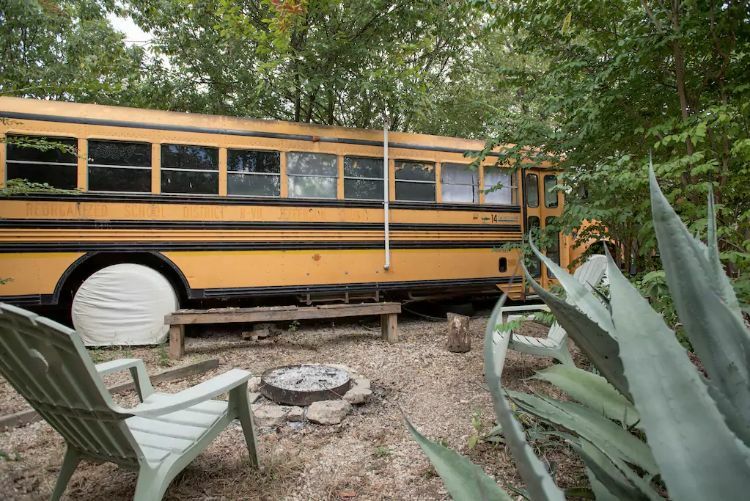 Head down to Austin for a relaxing weekend aboard a converted school bus that feels like a rustic cabin. 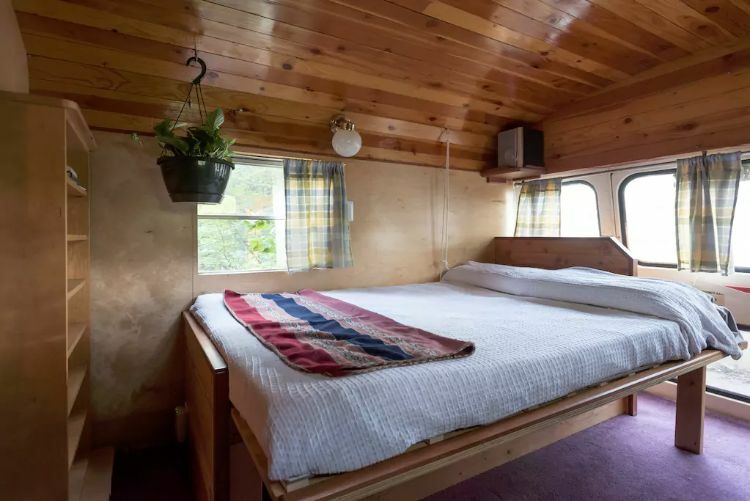 Packed with polished wood paneling, the cozy bus has plenty of space for two sleepers to camp in style. 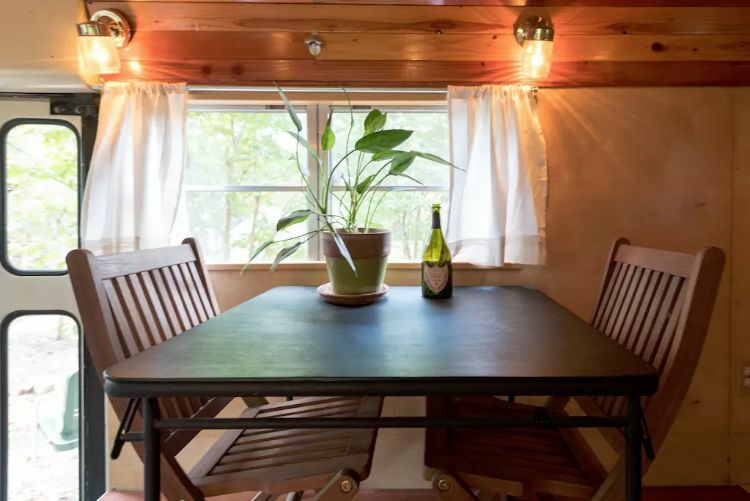 Located within walking distance of trendy and hip Austin bars and restaurants in the Cherrywood area, this spot is perfect for adventuring. 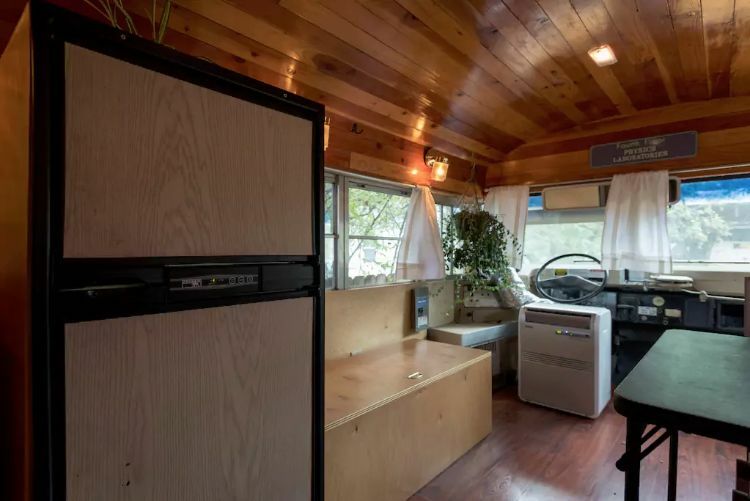 Fully equipped with a kitchen, bed and bathroom, the bus is parked on a property that also features a fire pit with plenty of room to enjoy the evening outside the bus. 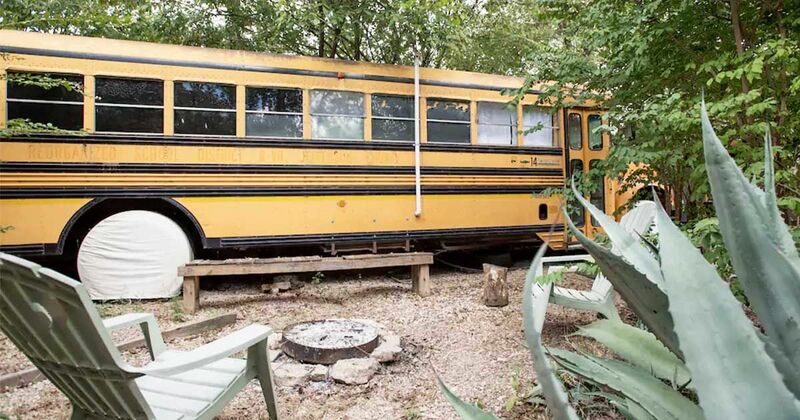 With homey decorations and a laid-back feel, this bus conversion has everything you need for a four-star weekend in the Lone Star State (Matthew McConaughey not included!). 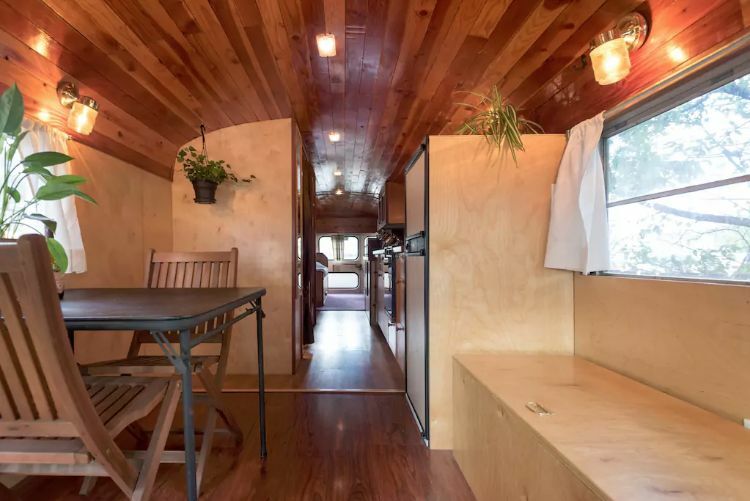 As you enter the home, you'll notice the bistro table and custom-built bench, which provides plenty of seating space at the front of the bus. 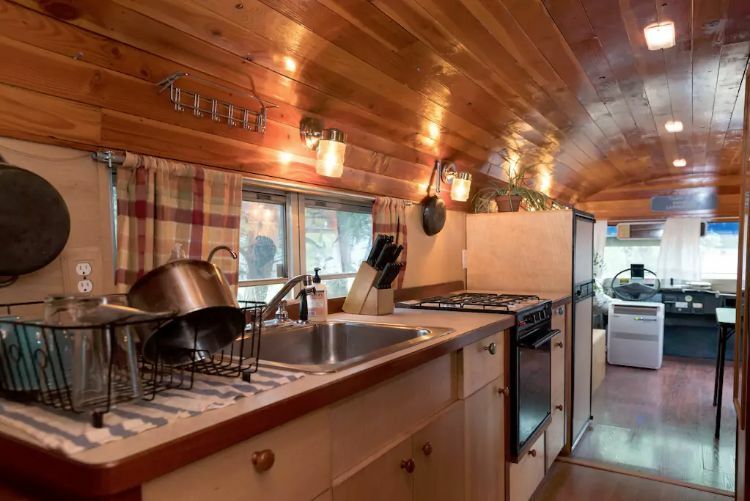 The wood-paneled refrigerator complements the interior well and looks almost vintage! A cute table for two features folding wooden chairs. The brass sconces add just the right glow to the bus's interior, and the windows have lovely curtains for privacy. 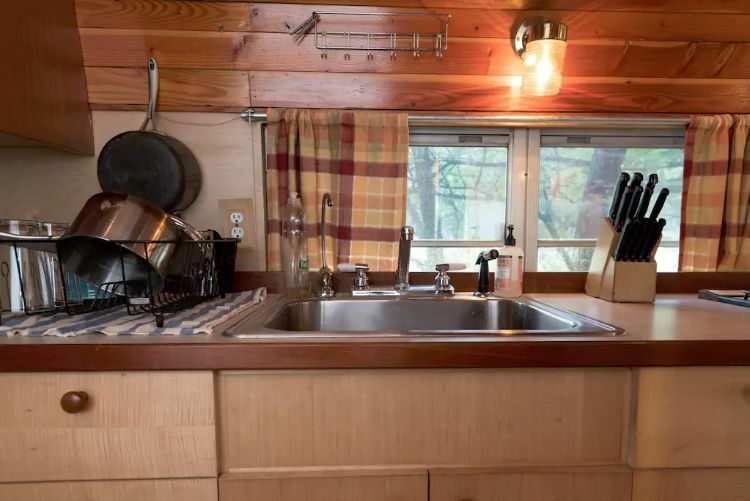 A complete kitchen is filled with amenities, including a stainless steel sink, oven/range, custom-built cabinets and drawers, and hangers on the wall for pots and pans. Plaid curtains give the space a charming feel! More sconces make the whole room feel appealing and warm. 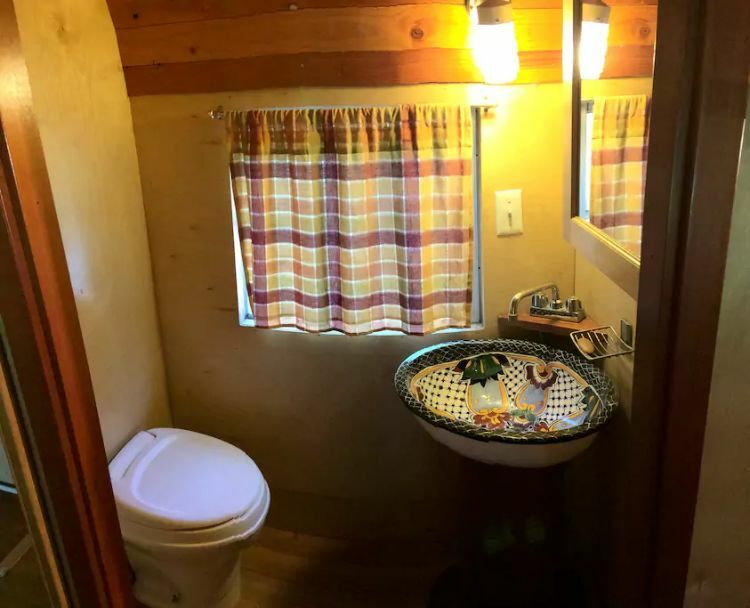 The small but adorable bathroom features a toilet and a standout sink; it's a picturesque basin with gorgeous painted designs inside the bowl. The mirror disguises a medicine cabinet. The wooden bed folds out to accommodate either one or two sleepers and folds back up to save space. The room also holds custom bookshelves, a dresser and overhead shelves. Notice the small shelves in the corners of the ceiling, which are for surround-sound speakers! 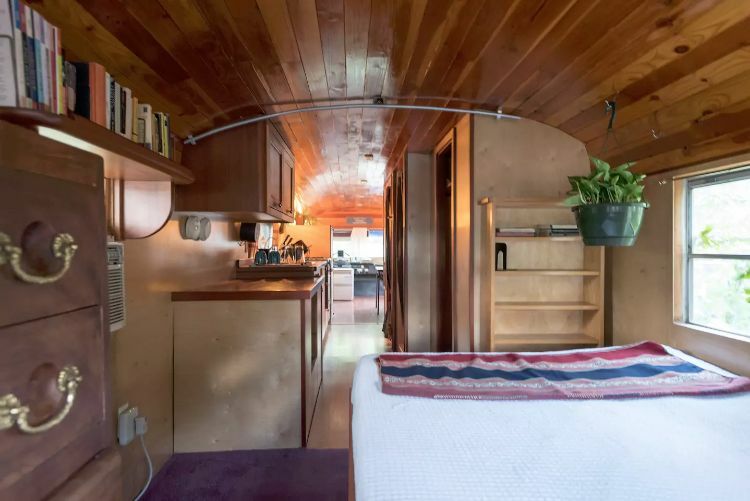 The view from the bedroom allows you to see how roomy this bus conversion really is. Plants add a fresh, vibrant touch to the space and a touch of color!